The donut hole, or coverage gap, is one of the most controversial parts of the Medicare Part D prescription drug benefit and of concern to many people who have joined a Part D drug plan. The good news is that it's steadily shrinking and by 2020, you'll pay the same 25 percent for drugs that you pay once you meet your deductible (if you have one). Although all prescription drug plans must explain the coverage gap in their literature and advertising, it comes as a shock to many enrollees when they go abruptly from making copayments or paying 25 percent of the drug costs to paying a much larger percentage once they enter the donut hole. 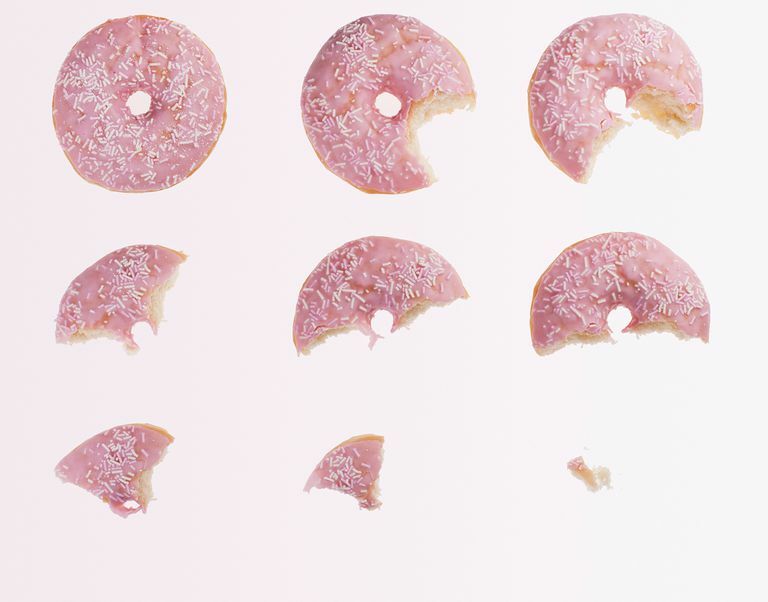 However, not everyone on Medicare will enter the coverage gap and if you qualify for extra help in paying your Medicare Part D costs, you won't fall into the donut hole either. If you join a Medicare prescription drug plan, you may have to pay up to the first $405 of your drug costs, depending on your plan. This is known as the deductible. Some plans don't have a deductible. During the initial coverage phase (after the deductible is met, assuming the plan has a deductible), you pay a copayment or coinsurance, and your Part D drug plan pays its share for each covered drug until your combined amount (including your deductible) reaches $3,750. Once you and your Part D drug plan have spent $3,750 for covered drugs, you will be in the donut hole (since the amount that your plan pays is counted too, you won't personally have spent this much in out-of-pocket drug costs by the time you reach the donut hole). Prior to 2011, you had to pay the full cost of your prescription drugs while in the donut hole. However, starting in 2011, a discount began to apply to the cost of drugs while enrollees were in the donut hole. In 2018, you pay no more than 35 percent of the cost of a covered brand-name prescription drug while in the donut hole, and 44 percent of the cost of covered generic drugs. The donut hole continues until your total out-of-pocket cost reaches $5,000. This annual out-of-pocket spending amount includes your yearly deductible, copayment, and coinsurance amounts, and it also includes the manufacturer's discount on the drugs that you get while in the coverage gap (so although you pay 35 percent of the cost of brand-name drugs while in the donut hole in 2018, 85 percent of the cost of the drug is counted towards your out-of-pocket costs, helping you get out of the donut hole sooner). When your drug spending reaches $5,000, the coverage gap ends and your drug plan pays most of the costs of your covered drugs for the remainder of the year. You will then be responsible for a small copayment ($3.35 or $8.35, depending on whether the drug is generic/preferred brand-name or non-preferred brand name) or coinsurance (5 percent of the cost), whichever is great. This level, when you're only paying a very small portion of your drug costs, is known as catastrophic coverage. The expenses outlined above only include the cost of prescription medications. They do not include the monthly premium that you pay for the prescription drug plan. It's important to understand that your Part D prescription drug plan may differ from the standard Medicare plan only if the plan offers you a better benefit. For example, your plan can eliminate or lower the amount of the deductible. And your plan can pay for generic or preferred brand name medications in the coverage gap. Beginning in 2011, if you reached the donut hole, you were given a 50 percent discount on the total cost of brand-name drugs while in the gap. Medicare began phasing in additional discounts on the cost of both brand-name and generic drugs, from 2012 onward. As of 2018, you pay 35 percent of the cost of brand-name drugs while in the donut hole, and 44 percent of the cost of generic drugs. By 2020, rather than paying 100 percent of the costs of your prescription drugs, your responsibility will be 25 percent, whether brand-name or generic. Charley Smith takes three medications to treat his high blood pressure and high cholesterol. These medications will cost him about $1,200 in 2018. Charley is switching to a Medicare prescription drug plan that has a low premium and offers the standard Medicare drug benefit, including a deductible and no drug coverage in the donut hole. Charley will pay a deductible of $405. He will then pay 25 percent (coinsurance) of the remaining $795 cost of his medications ($1200 - $405 = $795). His additional out-of-pocket cost during this initial coverage period will be $199. ($795 x 25 percent = $199). Since Charley did not reach the $3,750 initial coverage limit, he will not enter the donut hole. Charley’s total estimated annual out-of-pocket prescription drug cost with his Medicare Part D plan will be $405 (deductible) + $199 (his 25 percent share of his drug coverage) = $604 (plus his monthly premiums for the Medicare Part D plan). Mary Jones takes three medications to treat her type 2 diabetes, high blood pressure, and high cholesterol—all brand-name drugs. These medications will cost her about $4,500 in 2018. Mary joined a Medicare prescription drug plan that offers the standard Medicare drug benefit, including a deductible and no coverage for generic medications in the donut hole. Mary will pay a deductible of $405. She will then pay 25 percent of the cost of her medications for the next $3,345 worth of drugs (that's the $3,750 cap minus the $405 deductible) until she reaches the coverage gap. Her additional out-of-pocket cost during this initial coverage period will be about $836 (since $3,345 times 25 percent = $836.25). Since Mary did reach $3,750 in drug spending ($405 + $3,345 = $3,750), she will enter the donut hole. Prior to 2011, Mary would have been responsible for 100 percent of her costs at this point. However, since all of Mary’s medications are brand names, she will only have to pay about 35% of the drug costs while in the donut hole. She needs to accumulate another $1,250 in drug costs before she gets out of the donut hole, but both her own costs (35 percent of the cost of the drugs) and the 50 percent discount that the drug manufacturer provides will count towards reaching that $1,250. So while that will take about $1,470 in total drug costs ($1,250 divided by 85 percent), Mary will only have to pay about $515 out of her own pocket while in the donut hole (35 percent of that $1,470). Mary’s total estimated annual out-of-pocket prescription drug cost for the year with her Medicare Part D plan will be $405 (deductible) + $836 (her 25 percent share of her drug coverage before the donut hole) + $515 (what she has to pay while in the donut hole) = $1,756 (plus her monthly premiums for the Medicare Part D plan). Medicare.gov. Costs in the Coverage Gap. Medicare.gov. More Drug Savings Coming Through 2020. Medicare.gov. Save on Drug Costs. Medicare.gov. Yearly Deductible for Drug Plans. U .S. House of Representatives. Patient Protection and Affordable Care Act, Section 3301. Enacted March 23, 2010.